We received many emails from readers that asked us what type of battery charger should they use for their deep cycle batteries. In particular they wanted to know our thoughts on some of the best deep cycle battery chargers on the market and how should they be charging their batteries to get better battery life. Today, we want to dive into those questions and provide a specific guide to choosing a new charger that will definitely suit your needs. After carrying out more than 100 hours of research, we’ve learned that one of the most common causes of deep cycle battery failure is a “bad” charger. A bad deep cycle battery charger could have a whole range of elaborate and very unpleasant consequences for the deep cycle batteries. If you want your battery to have a long life and provide the best performance, you should understand the importance of charging your deep cycle batteries with a proper charger. Most deep cycle battery chargers are designed to diagnose, recover, charge and maintain a wide range of batteries, in a wide range of applications. Some specific chargers are designed only for AGM or Gel or Wet cells. And some trickle chargers can be left on a battery indefinitely. These would be used on a vehicle that is not used all the time or is stored away for the winter like RVs and boats. 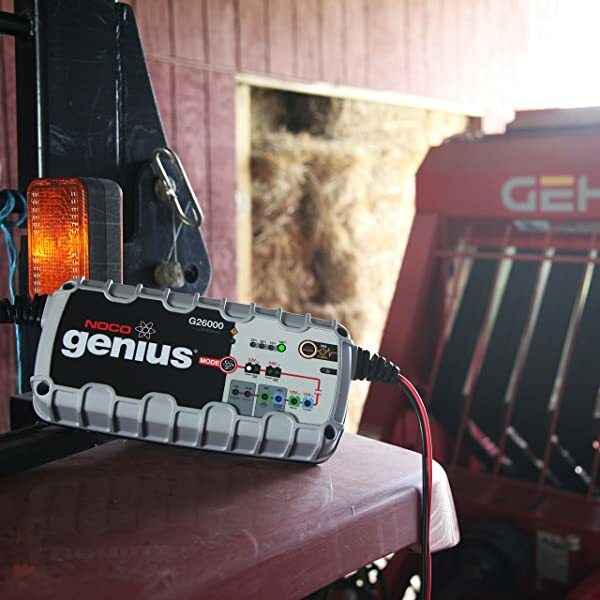 No matter what type of deep cycle battery you have or what kind of applications you’re going to use with your battery charger, we’re confident that the NOCO Genius UltraSafe Smart Battery Chargers will suit your needs. These are some of the safest and most advanced on the market. 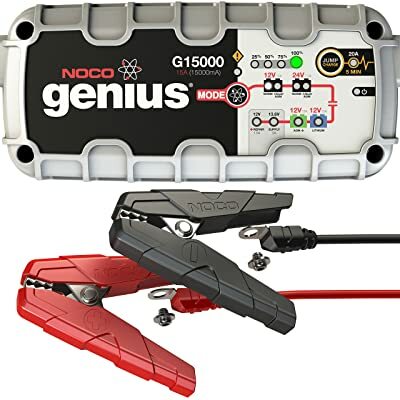 NOCO Genius smart battery chargers are designed to charge 6V, 12V and 24V lead-acid and deep cycle batteries up to 500 amp-hours and they can also effectively maintain deep-cycle batteries in your RVs, boats, cars, and lawn & garden vehicles. We love the fact that these chargers are able to charge 2x faster than ordinary battery chargers, they can also be used to jump-start dead batteries and repair damaged batteries. 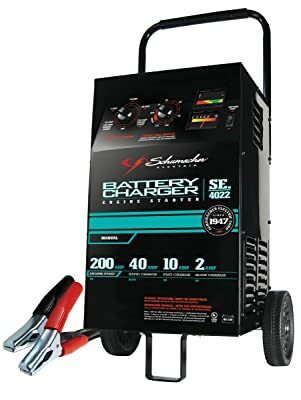 Sometimes, you’ll want a charger that can charge your deep cycle battery as fast as possible but won’t hurt the battery life, if so you should consider this Schumacher Wheeled Battery Charger with Engine Start. Its 40-amp fast charge mode can charge a battery in 1 to 3 hours. This charger is actually a multi-functional charging device. It includes a tester and gives professionals a wide range of charging rates and helps in fleet operations. It also has the ability to analyze electrical and starting system problems. When it comes to choosing a new deep cycle battery charger, it is important to choose one that charges your battery as accurately and efficiently as possible. Choosing the right charger is very important to ensure not only all requirements are met but also the charger is not over specified resulting in a more costly solution than required. Determining which charger is best suited your needs depends on battery type, battery capacity, how fast you want to charge your battery, and power sources (household outlets, solar power, or generators). What kind of deep cycle battery have you got? Lithium-ion and lead-acid batteries (including AGM, wet cell, and gel batteries) work with all kinds of battery charger as long as they’re suitable, but if you have a Gel battery, you should know that this type has a very narrow charging profile and it’s not easy to find the right charger for it. And due to each type requires the different charging characteristics, understanding how they work with a charger is the key to get the right one for your deep cycle battery. First, let’s start with flooded lead-acid batteries. This is the most common type of deep cycle battery in use today. Flooded batteries allow fluid in the form of hydrogen and oxygen gas to escape during charging and they do require regular maintenance. However, charging flooded batteries is much easier than other types of deep cycle batteries since these batteries can be overly charged with less risk of damage. Taking advantage of this feature, the flooded batteries can be charged by any deep cycle battery charger on the market in which the output voltage matches the input voltage of the battery. The biggest disadvantage of charging flooded batteries with a conventional charger is that it can take a long time to fully charge. And even longer if you use a cheap charger with a low output current. Therefore, flooded batteries should be charged with the best deep cycle battery chargers on the market to reduce the charging time. A multi-charge charger, like the Schumacher Wheeled Battery Charger with Engine Start, is a very good choice. With higher charge currents and multi-stage charge methods, your battery can be charged very fast. We love the fact that this charger has a wide range of charging rates so it’s suitable to charge your flooded battery system of any scale. One of the leading advantages of AGM deep cycle batteries is these batteries can be charged 5 times faster than flooded deep cycle batteries of the same amp-hour rating. AGM batteries are the most common battery type used in marine applications. However, unlike flooded batteries, AGM batteries are sensitive to overcharging and they also do not like heat. Therefore, if your deep cycle battery is AGM, choosing the best charger would be a bit more complicated. A charge to 2.40V/cell (and higher) is fine. However, the float charge should be reduced to between 2.25 and 2.30V/cell (summer temperatures may require lower voltages). A battery charger that is dedicated to charging 12V flooded lead acid often have a fixed float voltage setting of 14.40V (2.40V/cell), using it could overcharge the AGM battery. To protect and maximize the life of your AGM battery, you should select a multi-stage charger that has a setting for AGM. And because AGM batteries can be fully charged very quickly, we would highly recommend that you buy a charger that has max charge current less than 25Ah. Our top two picks will work just fine with any AGM battery, but there is a charger that is specially designed for charging AGM batteries and we’re confident that this is one of the best chargers for AGM batteries currently available. 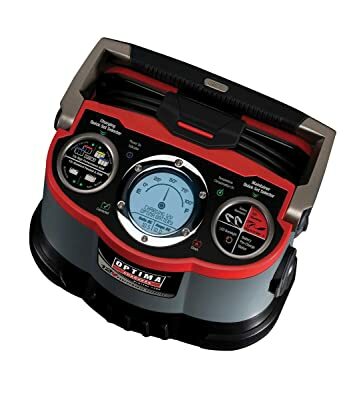 We’re talking about the Optima Digital 1200 12V Performance Battery Charger and Maintainer. This Optima’s battery charger features many built-in technologies and microprocessors which enhance the performance of 12V AGM batteries, recovers deeply discharged batteries and helps extend battery life. And if you already have an Optima’s marine battery, this charger is probably the best choice. GEL and AGM technology differ. Remember that the technology of a Gel battery is not the same as an AGM battery, which has its own charging requirements. If your charger offers different modes, select the correct one for your battery. If you use the AGM setting to charge a Gel battery, it won’t fully charge and, over time, it could actually damage your Gel battery. Gel batteries actually predated the AGM type but are losing market share to the AGM’s. But Gel batteries are still quite common in solar storage systems. Gel batteries tend to have VERY NARROW charging profiles and can be damaged easily by charging them inappropriately. If you have a Gel battery, do not charge it with a conventional car battery charger. There are several methods for charging gel batteries, however, constant voltage charging is the best way. For this type of charging, a fixed, regulated voltage source is used to charge the battery. There are two modes for constant voltage charging: fast charging and float charging. Smart chargers have both that modes and automatically switch between them. The best deep cycle battery chargers will monitor the ambient temperature and adjust the charging parameters accordingly. We think the NoCo UltraSafe Smart Battery Chargers are a very good choice for charging most Gel batteries, but if you don’t like them, we believe that this BatteryMINDer 12V 2/4/8 Amp Wet/Gel/AGM Battery Charger will satisfy you. This charger is regulated and will not overcharge, no matter what amp selection you make. It is just a matter of how fast you need to charge the battery. Plus, when used as a maintainer, it is guaranteed to maximize the battery life and improve storage capacity. The temperature compensated long-term maintenance stage will add years of service. Lithium-ion batteries cannot absorb overcharge. When fully charged, the charge current must be cut off. A continuous trickle charge would cause plating of metallic lithium and compromise safety. They should also operate safely within the designated operating voltages as the battery becomes unstable if inadvertently charged to a higher than specified voltage. For better battery life and performance, choose a charger that has a setting for lithium. And because all lithium-based batteries are safer at a lower charge, you should consider a model that has a low amp-hour rating (20Ah or less). This NOCO Genius G15000 is a very good choice. Read More: What’s the best quiet RV generator you can buy? Using a generator is the fastest way to charge your deep cycle battery during the power outage or when you need to charge deep cycle batteries in your RV as fast as possible. Most inverter generators have a 12V DC output built into them, however, trying to charge a battery using this is almost a waste of time. The 12V DC output is usually limited to around 8 amps, the voltage can fluctuate and is not suited to effectively charge your deep cycle battery. The best way to charge your deep cycle battery with a generator is to connect a Smart Charger to the 120V AC outlet of the generator. A smart charger uses 2 or more stages to charge the battery bank exactly the way it wants to be charged depending on its state. 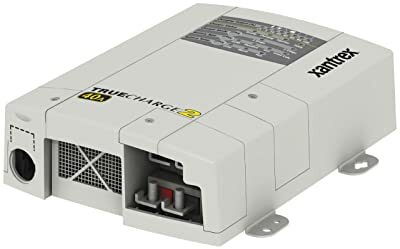 All smart chargers that mentioned above will work fine, but if you frequently have to use a generator to charge your battery, there is no one better than the Xantrex TRUECharge2 12V (20A, 40A, 60A) Battery Chargers. These are some of the best deep cycle battery chargers on the market. They are best suited for charging with a generator as they feature low electrical interference and can protect your deep cycle battery against voltage fluctuations and unexpected shutdown. We have discussed the best chargers for solar batteries in our previous guide to choosing the best deep cycle battery for solar power systems. But here are some basic terms that you should know about charging your deep cycle battery with solar panels. In solar power systems, the batteries cannot be charged without a Solar Charge Controller. A solar charge controller manages the power going into the battery bank from solar panels. It ensures that the deep cycle batteries are not overcharged during the day, and that the power doesn’t run backwards to the solar panels overnight and drain the batteries. However, a good solar charge controller is relatively expensive and in many cases isn’t necessary. For example, you have a couple of 100-watt solar panels and you only use them once time per month when you go camping with your family. But how do I charge my battery with a solar panel without buying a solar charge controller? 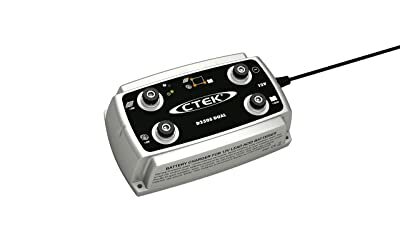 There is a simple way to do that – using this CTEK D250S Dual is a 5-step charger. This is a smart deep cycle battery charger which is designed to obtain energy from DC sources such as alternators, solar panels or wind power and optimises this power to meet the charging requirements of different battery banks. CTEK is a Swedish company which is known as one of the global market leaders in battery management solutions. And the CTEK D250S Dual is a 5-step charger is also one of the best deep cycle battery chargers on the market. It features a built-in MPPT solar battery charger (Maximum Power Point Tracker) that helps the solar cells produce power as efficiently as possible by taking the most efficient source of energy from the solar panels automatically, and then using the power to charge the battery. You’ve been looking around for a way to help pump some juice from the outboard alternator and deliver it to your trolling batteries to extend run times, decrease on-shore charge times and increase battery life. If so these are things you should know. To effectively deliver some juice from the outboard alternator into deep cycle batteries on your boat, you’ll need a DC alternator on-board charger, not a standard on-board charger. This particular type of charger takes voltage from the engine’s alternator and directs it to the trolling motor batteries so that they will be recharged while the engine is running from one fishing hole to the next. The best and most efficient DC alternator on-board charger on the market is the MinnKota MK-2-DC Dual Bank DC Alternator Charger that you can buy from Amazon. This charger is engineered with advanced corrosion protection to withstand the destructive effects of saltwater. It can be used only for flooded and AGM batteries. Most deep cycle battery systems that we have is 12V. 12 volts is simplest and most standard, used in cars, RVs, trolling motors and boats. If you want a small simple power system, 12 volts will probably be easiest. But in some applications such as marine or home solar energy systems, where we often build large battery banks that store hundreds or even thousands amp-hours, the 24V or 36V or 48V system has some technical advantages over the 12V system. You can use a 12V battery charger to charge one 12V battery at a time, but charging your batteries in such way is almost a waste of time. The best way to charge deep cycle batteries in the 24V/36V/48V systems is using a smart charger that provides an adequate output voltage. There are many battery chargers on the market for these systems. They come in many different shapes and sizes and price. 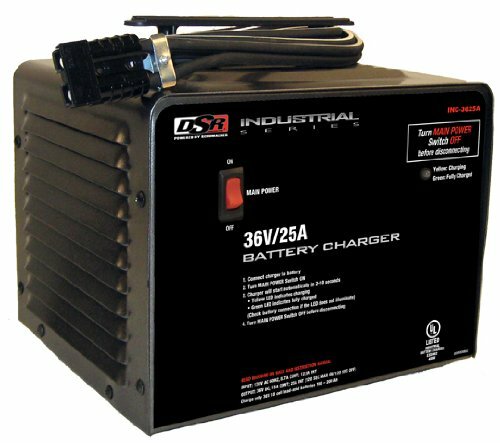 Our favorite models are Schumacher’s INC Digital Chargers (36V/48V) – these are some of the most reliable and best deep cycle battery chargers you can buy. Batteries in these systems also can be charged with a multiple output charger, like a three or four bank unit in this case, with each battery getting its own connection at battery voltage. How many amp hours does your deep cycle battery store? Deciding how big your deep cycle charger needs to be is determined by the size and type of your battery. We all know that the more current you put into the battery, the faster the charging. However, using too large a charge current on a small battery can lead to boiling and venting of the electrolyte. It’ll shorten the battery’s long-term health. Charge current needs to match the ability of the battery to absorb the energy. 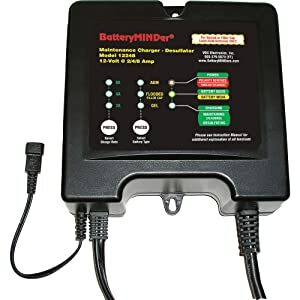 If you have a 100Ah flooded lead-acid battery, the best deep cycle battery chargers should have maximum charge currents of 25Ah or less that would take about 4 hours to recharge it if the battery were completely dead. Some folks wanting quick recharge should look for a charger with more amps. If you’re not in a hurry, you can select a smaller charger. We don’t know what will happen tomorrow, so the best solution is selecting a charger that can provide a fast-charging mode and a slow-charging mode, like our top picks.